Yes, Kung Fu Yoga, but before you scoff at the title remember the writer/director of this classic style Jackie Chan romp was none other than Stanley Tong. Mr. Tong began his career as a stuntman in China, and after a huge success with Stone Age Warriors, of which he wrote, directed and stunt coordinated the film, he later directed Jackie Chan in SuperCop. Other Jackie Chan films he has had a hand in were both the American film Rumble in the Bronx and First Strike. He was a perfect choice for Kung Fu Yoga. Stanley Tong’s history aside, everyone always seems to wonder at Jackie’s age can he still do the physical comedy we all know and love? Even though Jackie astounded us in the movie The Foreigner with a change to action drama opposite Peirce Brosnan, and showed us, yes, he could still take some knocks and bounce back, Kung Fu Yoga had the more fun feel Jackie has brought to the screen so many times before in films like Project A and, one of my favorites Wheels on Meals. The story revolves around two college Professors, Jackie playing Jack Chan (making it easy not to forget your characters name when on screen) China’s leading archeologist, who also admits to being a huge Indiana Jones fan, is teamed with the stunning Ashmita, played by the Indian actress Disha Patani, to uncover an ancient treasure of India. Ashmita steals every scene she is in with her intense beauty and intelligence, also stealing Professor Chan’s heart from the moment he lays eyes on her, which leads to some very comical ‘showing off’ in totally classic Jackie Chan style. Ashmita and Professor Chan play well off one another, bringing an interesting comparison between the philosophy surrounding yoga and the skills of Chan’s kung fu, hence the title of the movie, and done all in good fun. Professor Chan and Ashmati are joined in their adventure by Chan’s two college assistants Xiaoguang, played by Yixing Zhang, and Nuomin, played by Miya Muqi, and to round out the troupe, the Professor’s adventurer/archeologist/tomb raider nephew Jones, played by Aarif Rahman joins the crew. I thought Rahman’s ‘Jones’ was a simple homage to the Indiana Jones films, since they were mentioned in this movie, and several scenes were reminiscent of Indiana Jones and the Last Crusade. The story takes our merry band from frozen, rugged regions of the world to the heart of India itself in search of the Magadha treasure of the Bhima family that once unlocked with benefit all mankind. As they trek through each new obstacle they are viciously pursued by, of course, the villain who feels his family is heir to the treasure first, the wealthy Randall played by Indian actor Sonu Sood. Sonu Sood’s martial arts background has been limited to training for specific action films, and his background has been in krav maga as well as jui-jitsu, but was reported to jump headlong into the training to make the fight scenes more realistic and believable and in Kung Fu Yoga it shows very well. 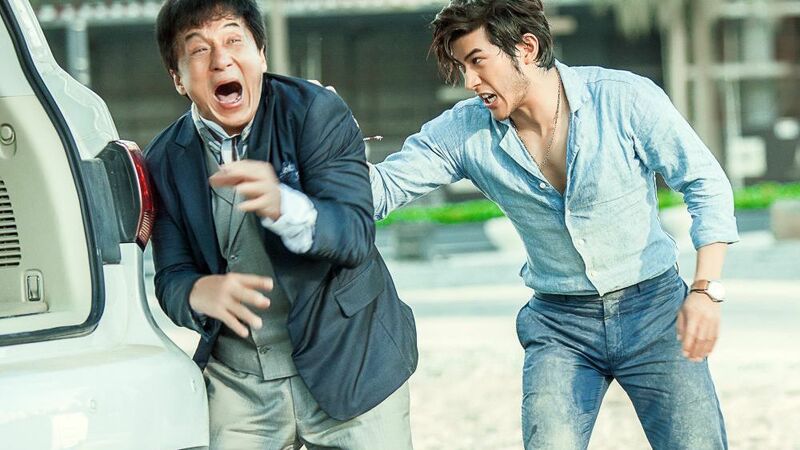 In a lot of Jackie Chan’s recent outings in Asian cinema he has been introducing the world to new up and coming talent, and to be honest, a lot of the films have been lacking due to the limited time Jackie has on screen with some of those films. The thing that delighted me most with this movie was the appearance that Jackie actually dominated the screen in most of the fight sequences, and his proteges were able to add to the signature style Jackie Chan has always made abundant in his movies. From fighting in an ice cave and trying to keep their balance against armed intruders, to a rescue from a hyena pit, that despite the fact my mind knew the animals were CGI renditions for some of the stunts displayed, I did not mind at all as it was still fun to watch. Jackie’s antics in this film are everything from his playful smile to his fierce intensity, and even to the way he runs frantically as he tries to recover a jewel that will open the treasure of the Bhima family that will benefit the world. Even be on the lookout for a snake charming scene using snake fist style kung fu that Jackie made popular in the 1978 film Snake in the Eagles Shadow. If you have always been a Jackie Chan fan, or Team Chan, when it comes to martial arts films, and films like Project A, Operation Condor or Super Cop hold a spot in an atrium or ventricle of your action movie lovers heart, and you want something a little more slapstick than blood and guts, then this is a fun popcorn family film to watch. The villain is devious and determined, and while Professor Chan’s motives are the betterment of archeology and the preservation of history, his other obstacle to get past is broadening his tomb-raiding nephew Jones’s motivation for fortune and glory. The sub-story there is Jones’s father died trying to find the Magadha treasure, and Jackie does not want Jones to squander his father’s legacy by simply getting rich when he could fulfill a family destiny by proving his father was right. The lessons are taught time and time again throughout the film even to a little uncle versus nephew sparring, where Jones learns Uncle Jack may not be as young and spry a fighter as he once was, but with age comes experience and craftiness that wins out in the frustrating end. Rahman is, in reality, a mix of India and Chinese heritage, and in playing Jones in Kung Fu Yoga, he actually gave me more hope for the future of Chinese cinema after Jackie Chan retires. I always wonder who will be hard pressed to fill those huge shoes that legends like Jackie, Sammo Hung, Yuen Biao and Donnie Yen, as well as the late great Bruce Lee, will leave to fill, but one of the great things about Jackie as a person is he not only makes his films, but he cultivates the next generation of action stars through his famous Jackie Chan stunt team. Kung Fu Yoga is on a five kick scale I’ll give it three kicks and a reverse punch, so enjoy. Jackie Chan stars as Jack, a world-renowned archaeology professor who must locate and save a lost ancient treasure before a team of mercenaries destroys it forever.